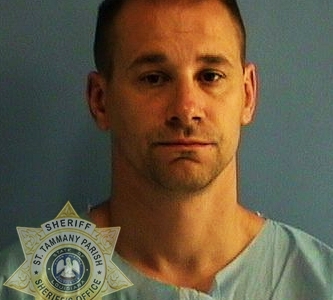 St. Tammany Parish Sheriff’s detectives have arrested a former law enforcement officer for sexual battery. On Tuesday (June 12), deputies responded to a residence in the Mandeville area after a woman reported she had been sexually battered by an unknown male, later identified as Gerald Yates (DOB 12/26/1975). The victim told deputies that around 2PM (June 12) she observed a vehicle repeatedly drive past her residence several times while she was working in her yard. Eventually, the driver stopped in front of her residence and exited his vehicle. Yates and the victim engaged in conversation for a short time before proceeding inside the garage, where the victim stated she was inappropriately touched beneath her clothing by Yates as he made lewd comments. The victim demanded Yates stop and leave; however he disregarded her commands and grabbed her arm in an effort to prevent her from exiting the garage. The victim was able to break free from the subject’s grasp. As she fled, she observed Yates with his pants down around his ankles, exposing himself. The victim then told Yates she was expecting family to arrive at her residence. At that time, he pulled his pants up and exited the garage to the front yard where he remained for several minutes until a family member arrived. He eventually left in his vehicle. Yates was most recently employed as a Correctional Officer with the Tangipahoa Parish Sheriff’s Office where he resigned his position while under investigation. Yates had been previously employed and subsequently terminated from the St. Tammany Parish Sheriff’s Office for violating departmental policy, where he worked as a Court Security and Criminal Patrol Deputy from 2007-2009.